First, we're going to talk about the traditional process for finding your color palette: color analysis. and Lastly, an easier and low/no cost high quality process on how you can identify your color palette using items in your wardrobe. So what is a color analysis? A color analysis suggests that your skin tone is nicely paired with specific seasons and within those seasons there are specific colors that look best on you. To have a color analysis professional do a personal color analysis, it can range from $80 - $500. Step 1: I would first determine if you have cool or warm undertones by doing a series of tests that involves placing gold or silver drapes over you. If you glow with the gold, it would indicate warm colors look good on you - likewise for the silver which would indicate you're cool. Step 2: Then, based on those results, I would use a series of cool or warm colored drapes to confirm what we discovered in Step 1. Step 3: To be 100% sure (because you'll be buying a whole new wardrobe based on these colors, right? ), I'd also look at the color of the veins in your wrist - blue hued veins would mean you're cool and green hued veins would mean you are warm. Step 4: Next, I'd look at your eye color - darker eyes means you're more of a winter. Lighter eyes - you're more of a summer and so on with spring and fall. We're almost done - I promise! Step 5: Now let's say based on these tests - you have dark eyes, dark hair, blue hued veins and so on. I'd determine you're a winter - I'd do a few more drape tests to determine if you're one of three winters: cool winter. deep winter. clear winter. And voila we'd have your color palette. The traditional color analysis system has been criticized by many due to its inability to translate to a wider spectrum of skin colors and on surface seems to only work for fair or pale skinned people who have blue, green, gray eyes, very light to medium colored hair. But even then, fair skinned women confined to a lighter color palette may like more bold and vivid colors. Based on the traditional color analysis - I'd be a deep winter or a dark autumn. As would the majority of people on earth who have darker eyes, darker hair, and darker skin. 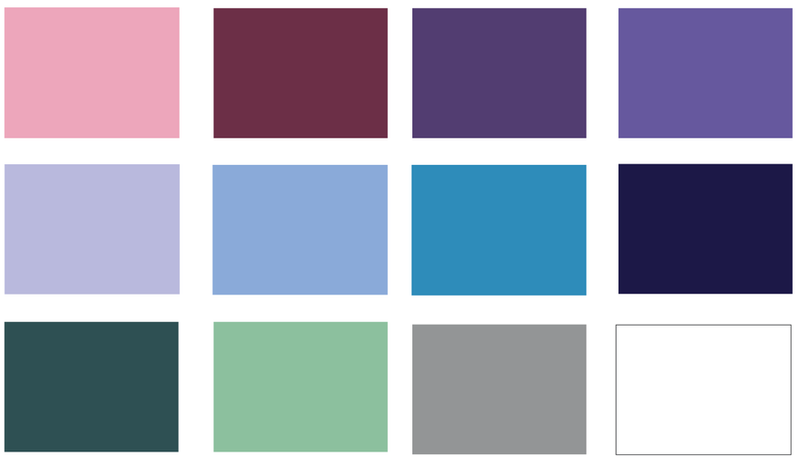 This color palette would be considered my best colors - and let me tell you - on me that deep winter palette is just blah. The Bible uses color as a way to express ideas. Thoughts. Status. Importance. We see this today in cultures around the world - wearing bright, bold, vivid colors for celebrations and hospitality and even blacks, neutrals, tans, and grays for solemness, maturity, and respect. And for the most part, the skin color and features of these cultures vary widely. They are different shades, different features, wearing warm bright colors - which a traditional color analysis would say is out of their palette. Now, I'm not saying that no one should ever get a traditional color analysis. This process works very very well for fair skinned women who have lighter to medium colored features. But even then, you still may strongly dislike the colors in your color palette! Who wants to spend all that money on something that you may never like or may not want to change your entire wardrobe to suit? So How Do You Find Your Color Palette? What I'm going to share with you is not just a theory - it's what I actually do in my own wardrobe and provide as a service to my clients. This will be one of the easiest but profound things you do to create a wardrobe of color that you'll love and apply year round. Let's get started. Head to your wardrobe and find your favorite multicolored piece. (Don't have a multicolored piece you wear? use a favorite scarf, umbrella, or shoes - anything will do). Take really good note of the colors in this piece. Even the colors that don't seem as apparent as others. Now look at your wardrobe - do the colors you noted appear in your wardrobe? If they do, see how many outfits you can create using these colors. The goal is to create at least a weeks worth of outfits from this color palette. A weeks worth is important - it signifies you have a good color palette foundation to build on. The collage you're about to see isn't very clear. I was really into Insta's filters at the time. This is the color process in action for my own wardrobe a year or so ago. I went to visit my Sailor one winter who was in Virginia for school and challenged myself to bringing only 7 Items for 7 Days - which some of you know as a capsule wardrobe (you can visit the Insta Post here). The critical part was making sure that all of the items matched. So I created and used the 3 Steps above to pull it off. Can you go through the 3 - Step Color Process above to see how I put these colors together? Wear. The colors. You want. If you see an electric blue dress that would look cute for date night or a gray hued outfit that would be perfect for a day out - girl. wear. it. God created colors for us to behold the beauty in creation. That means you and me friend. This post is simply for you to create your own color palette. A color palette for you to express who you are. One that you enjoy and actually wear!